It is surely the stuff of science fiction: An extraordinary being arrives on Earth that can withstand a tortuous array of conditions: boiling, freezing, tremendous atmospheric pressure, near total dehydration, and exposure to massive amounts of ionizing radiation. While many joke that “cockroaches would be the only thing to survive an extreme global nuclear war”, in fact, cockroaches would not. These creatures would. They are also the only life form known to be able to survive the near vacuum of space for extended periods. (Note: humans can actually survive the near vacuum of space for about 90 seconds without long term damage, but we have nothing on this creature.) They can lie dormant for 10-100 years and then come back to life with a drop of water. 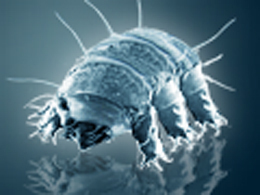 When it comes to durability, nothing on Earth can match the very real “Water Bear”- a tiny creature the size of a grain of sand (averaging about a millimeter long) that is often lauded as the toughest creature on planet Earth. There are over 1000 known species of Water Bears (called such because when they walk, their gait loosely resembles plump little bears ambling along on eight legs). Also known as “tardigrades” (from the Latin “tardigradus” meaning ‘slow walker’), they thrive in the most extreme environments on every corner of the Earth- from the Equator to the Polar regions- forests, swamps, deserts, tundras, mountains, glaciers, hot springs- from the highest point on Earth along the Himalayan mountain range, to the deepest parts of the sea, tardigrades are there. Less excitingly, they can also be found in your backyard where you can usually find them in common moss, lichens and ferns, feeding on natural detritus in the undergrowth. One of the keys to this hardy creature’s success seems to be the presence of a cellular sugar called trehalose which preserves the membranes that form their bodies. Although hardly the answer to human suspended animation, scientists are looking at trehalose as a viable way to preserve human eggs during freezing for later fertilization. Not remarkable enough for you? Tardigrades can also survive as high as 5,000 grays or 500,000 rads of ionizing radiation, though above 100,000 rads does seem to make them sterile. For reference, humans die around a “mere” 1,000-2,000 rads and will suffer significant damage with much less. In order to test some of the tardigrade’s amazing abilities, in 2007, the European Space Agency launched the FOTON-M3 spacecraft hurtling a capsule full of science experiments into the heavens. Its subjects included live tardigrades, who returned from space after orbiting Earth for 12 days, all the while being subjected to the near vacuum of space and the full spectra of deadly solar and cosmic radiation. How did the Water Bears hold up? No problem for a large percentage of them. About 68% of them were just fine and kept on amblin’ once back on Earth. For reference, besides surviving the near vacuum of space, some species of tardigrade can also withstand up to 6,000 times atmospheric pressure at sea level. This is about 6 times more pressure than at the deepest point in the ocean. I, for one, welcome our new tardigrade overlords. Is a Dog’s Mouth Really “Cleaner” than a Human’s Mouth? So if the tardigrade is so resilient, why isn’t everything on the planet coated with a thick layer of them? Well, it turns out the natural life span of the tardigrade is just about a year, unless they are dehydrated. In that case, obviously the record is currently about 120 years as listed above. When the tardigrade emerges from its egg, it actually has all its adult cells and does not grow in terms of number of cells. It does increase in size, though, as individual cells enlarge. Because their hardiness verges on indestructibility, this little bear’s ability to survive beyond Earth’s atmosphere encourages speculation that they could have potentially come from outer space, a belief known as transpermia. Whatever the case, the first known tardigrade seems to have popped up on Earth around 530 million years ago. Most tardigrades eat plant matter and bacteria, although some prey on nematodes (tiny worms) or other creatures, foraging around with their signature lumbering gait. Although tardigrades generally consist of males and females, some species have been identified as parthenogenic (a form of asexual reproduction) or even hermaphroditic. The tardigrade’s survival and adaptability strategies are so effective it shouldn’t be surprising that its mating method is just as efficient. In most observed species, when the female molts, she leaves some eggs in her cast-off skin, after which the male fertilizes them with sperm and then lumbers on his way. Do you want to see a Water Bear for yourself? Or is your kid on the market for an awesome science project? You’re in luck, because anyone with a microscope can observe tardigrade behavior up close and personal. Just find a piece of moss, soak it in some spring water in a petri dish and see if you can spot a tardigrade among the creatures that begin to animate your scope’s visual field. @John Morke: Yep, thanks for catching that. Fixed!